I woke up soon after the theme was announced. The results were very interesting, and I’m very happy with the theme. I spent some time thinking about a game to make, and I’ve been wanting to explore the incremental game genre for a while. I slept a few more hours, talked to some friends, thought about the game, then started programming at about noon. Over four hours, the game got simpler and simpler as I explored mechanics, and at 4 pm it felt complete. I am done. It feels very strange to finish this early, I’m usually struggling up until the last couple of hours. Good luck and have fun, and I can’t wait to see what you all make! After wasting a lot of time yesterday on getting sidetracked with another game idea and not having any idea what to make, it all kinda just fell in place and the game got made pretty quickly after that. I got to learn a few new things (how to use Web Audio, and that Dart does VERY lazy field initialization), and I actually get to go to bed at a reasonable time after a Ludum Dare. I can’t wait to see what other games have been made this weekend. If you’re still struggling with yours, good luck, and I believe in you! I found this theme very challenging. All ideas were either way too narrow to be fun, or way too broad to be restricting at all. While I was trying to figure out what kind of game to make, I implemented the WebGL framework I needed in Dart, which involves quite a lot of heavy lifting, including having to write shaders. WebGL gives you almost nothing for free. Once I had the framework up and running, I had no idea what game to make, so I temporarily ditched what I had to try out another idea. That idea sucked, so I went back to the original mess and slowly over the day turned it into a game about santa claus having to gather wood in order to be able to create all the toys he will soon distribute. Tomorrow, I will tweak and try to balance the gameplay, add a titlescreen and a game over screen, and look into getting some sounds in there. For once, I’m not worried about running out of time. I’ve been doing LD on and off for a long time, and it’s some of the most fun game development I’ve ever experienced. Sure, there might not be enough sleep, and the food might not be the healthiest in the world, and the final hour or two is a frantic scramble to get rid of the most crippling bugs and trying to polish things up enough to make it all seem at least a little bit game like, but it’s all worth it. The sense of completion when/if you finish the game is incredible. I can’t want to see what games people make with whatever almost certainly horrible theme we end up with. Lacking is a bunch of more item interactions, more monsters, sounds, and some kind of game goal. After some 3.5 hours of work, I’ve at least got the core running..
For some reason I decided to really limit myself technically. The screen is 160 x 120 pixels, and the only available graphics is drawing four color 8×8 pixels sprites. Each color index can be one of 240 different colors in each sprite, and the sprites can be flipped along the x and/or the y axis. The idea is to make sort of a 2d Minecraft or a harvest moon clone, where you wake up on some shore and have to do the best you can with the tools you find on the island. I uploaded a Timelapse of the Chambered to YouTube! I recorded this at one pic every four seconds, and it ended up being about 14 minutes at 60 fps, so this video is skipping quite a few frames. So when’s the next LD? I miss it already. I made a dungeon crawler! I recorded the entire process at one screenshot every other second, and streamed it all live. I didn’t do as much talking as I hoped I would. It’s very difficult to stay interesting when concentrating.. The first several hours were spent making the game renderer from scratch. I chose a low resolution screen with simple four bit images that can be tinted to any color, which sets the graphical tone in a nice way while still letting me draw art fast. Levels are designed as images with each color representing a different block, and the alpha channel containing the “id” information. For example, a pressure plate with id (alpha) 200 will open all doors with id (alpha) 200. I can override this default trigger behavior in the code to do more advanced pressure plate logic. One major inspiration for this game was Link’s Awakening, which I’m currently replaying again on my 3DS, so the game world is based on a central hub with a few different dungeons you need to complete in order. In each dungeon, you find a unique item that lets you access the next dungeon, and a boss monster that drops a key. Once you have four keys, you can open the final door and win the game. The game play ended up being slightly more action oriented than I originally thought, but that is probably a good thing. Except for a few places where you can get yourself stuck, I think it actually plays fairly well. I tried to design the levels so that there were very few wasted blocks to make the game feel tight and complex. There are two hidden trinkets per level. and usually two hidden powerups as well. All-in-all, there are six levels in the game, and even something that actually feels like a boss fight. In the last couple of hours, I added stuff like sound (SFXR, woo) and title screens, while trying to play test the game as much as I could. I got in bed at about 5 am or so, feeling exhausted and happy. I think I’m making a dungeon crawler! 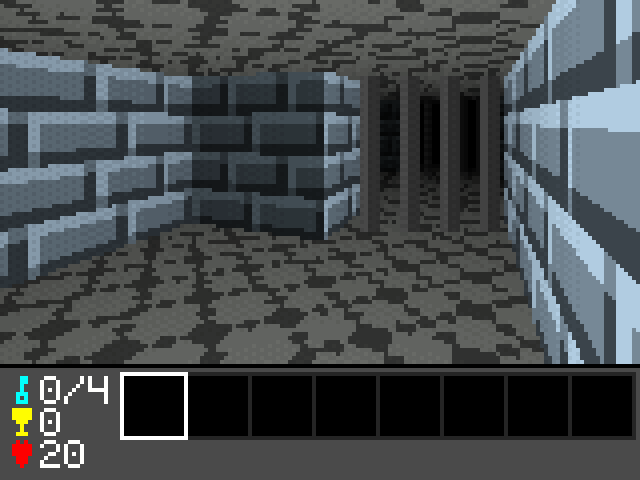 As usual, I just barely know what I’m doing, but it’s turning into some kind of low-fidelity dungeon crawler. Next up is implementing sprites and movement. I should be sleeping, but I’m not! 2:30 am. 1.5 hours left until LD #21 begins. I’ve prepared my recording tools, set up a blank new project in eclipse, and I plan on staying up until the theme is announced. Then I’ll get some sleep and let my dreams invent games for me, and get cracking tomorrow when I wake up. As usual, I will be making games from scratch in Java. I’ll use Eclipse, Paint.net, and quite possibly SFXR. I’m in, and I’m hoping for recursion!! I’m joining this weekend, I’ve sent my little “hello”-vid, and I’m super excited to see recursion on there! I mean, without recursion, how would you explain the joke at the end of the post someone just submitted? You can play what I managed to finish here. You can get the source code from there as well. Well, six hours to go, it’s 9pm, and tomorrow is Minecraft Beta Day, something I probably should be well rested for. My game is nowhere near a game yet, although the game engine is pretty fun. I spent all of today working on just the engine. You can go up/down stairs, pick up items (actually, the engine can detect clicks on any sprite), and throw items now. I sleep now. Tomorrow, I turn this into a game. As usual, I’m working in Java, and I make everything from scratch. I decided to go with a purely billboarded sprite based 3d engine this time, and I’m making some kind of dungeon crawler a la Dungeon Master or Eye of the Beholder. I’ve got much of the engine implemented, and it’s about time to start working on the actual game now. The plan is to build game areas, and add the required game features as I go along, so I won’t implement monsters until the map actually requires monsters. Click here to try the latest version. Use WASD + Q +E. There’s not much gameplay yet. I’m also streaming the entire thing live here. There’s no sound because I have a cold, but there is soothing music. I want to make a first person dungeon crawler a la Eye of the Beholder. Of course, having said that, I’ve jinxed any chances of a suitable theme winning. Making an interesting tile based first person game about evolution might be an interesting challenge..
44 queries executed in 0.106 seconds.